It often happens that we need our program to wait for some condition to occur. This condition may depend on some external process that updates the condition asynchronously, meaning in a non-predictable (non-specific) time. A typical example is user mouse or keyboard actions in a GUI dialog window, or a specific signal that is received from hardware. Matlab has a couple of built-in functions for blocking Matlab’s main processing thread until certain asynchronous GUI events occurs. waitfor is documented to block code execution until either the specified GUI handle object is deleted, or is updated (possibly to a specified value), or Ctrl-C is pressed in matlab’s Command Window. uiwait similarly blocks execution, until a specified figure handle is deleted/closed, or a separate processing thread (typically, a callback function) calls the corresponding uiresume (I discussed uiwait/uiresume, together with their uisuspend/uirestore siblings, last year). uiwait, unlike waitfor, has an optional timeout parameter; on the other hand, uiwait cannot wait for a non-deletion event on a regular uicontrol property, as waitfor can. Other related built-in Matlab functions are waitforbuttonpress, pause (which awaits user mouse/keyboard clicks), and ginput, gtext, rbbox, dragrect (which awaits mouse clicks in a plot/image axes). Some toolboxes have other similar blocking functions, for example roipoly in the Image Processing toolbox. But what if we need to wait for an event to happen on a non-Matlab (HG) object? Say on an ActiveX control property or even on a non-graphical Java object? The reason we need this deliberate pause is to enable the CPU to process other processing threads, namely that thread which is responsible for updating the field value in due time. Without this pause, it would take the CPU much longer (if at all) to get to that thread, and our overall application performance will actually degrade, since the event will take longer to get processed. Adding deliberate pause delays as a mechanism to improve overall performance may sound counter-intuitive, but this is in fact the case here. Performance tuning can indeed be counter-intuitive sometimes, until you learn the underlying reasons when it becomes clear (I’ve shown several examples of this in the past, here, here, here and here). We should take care not to set too high a pause delay, since that will unnecessarily delay processing of the incoming event; on the other hand, setting it too low will return the thread-starvation issue explained above. A pause value of 5-50 millisecs (0.005-0.05) should be about right for the vast majority of applications. Note that different platforms run your application at different speeds, so be careful not to over-tune this delay to a particular computer. 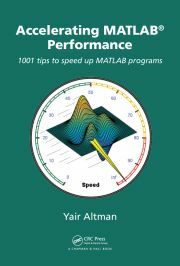 Interested in learning more Matlab performance or advanced programming tricks? Then consider joining my Matlab Performance Tuning, Advanced Matlab GUI and/or Matlab-Java programming seminars in Geneva on August 21-23, 2012 – email me (altmany at gmail dot com) for details. Thanks for your post, very interesting. It seems like conceptually, one could create an effectively multi-threaded MATLAB application using the ideas in your posting & the MATLAB compiler. Each thread would be deployed as a separate process & messages / event info would be passed between the processes via a robust message broker, e.g Java GlassFish. I’m also thinking it might be possible to take this idea one step further, via the Parallel Computing Toolbox. Worker threads could be programmed to immediately go into async “stand-by”, per your post, & then be controlled via the message architecture. This would cut out the PCT set-up/retrieval overhead, which over hundreds of parallel jobs could be significant. Have you ever worked on or heard of any MATLAB projects where something like this has been done successfully? It seems pretty straightforward, doesn’t it? Do you have any experience using MATLAB & GlassFish together? If so, how did things go? p.s. I wasn’t able to get the HTML carriage return tag “br” or the paragraph break tag “p” to work in my comment. Could you please advise on how to achieve paragraph breaks? @Brad – thanks. I haven’t used GlassFish before. What you suggested sounds reasonable on first read, but I have never attempted such inter-process Matlab communications. I do know that Matlab IPC has been attempted by others, though. There are even several such mechanisms on the File Exchange, although I don’t know whether they use an efficient async mechanism or inefficient polling. Re para break, simply press the ENTER key twice – this will automatically create the paragraph break that you were looking for, just as in you own comment. @Alex – no, but you could add a check for the timeout condition in your calculation function (in its main loop for example), if you can modify its source code. Do you think this also means that only one *process* is allowed to access the MCR at a time? If so, then wouldn’t this effectively preclude multiple deployed apps from running at the same time? That doesn’t seem right, though, does it? @Brad – I do not have any additional information on this. It should be simple enough to test, and you could always ask MathWorks support about this. I’ve doing data polling from a sensor with Matlab’s pause command in the loop for some time. My application was leaking memory and would crash after several hours. Matlab support confirmed they have a memory leak issue when calling pause within a loop on R2011b and R2012a. Any ideas on how to accomplish what you describe above with Matlab objects? I tried passing in a handle class object and Matlab didn’t like it. Yair, this web site is an incredible resource. Thank you!! A long time ago I created code that has loops like the one you show here to wait for asynchronous events. But it never works well. All of the testing I have done indicates that no other threads are executed when Matlab executes a pause command. The wait loop never receives the event, because the thread that is supposed to create the event never gets executed while the wait loop is running. Are you sure Matlab does allow other threads to run while a pause is executing? do waitfor only take java object as arguments or matlab object reference as well? If so which package should i add to be able to implement the the waitForDone function described above? 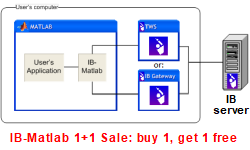 @Bolivar – waitfor also accepts Matlab handles. See http://www.mathworks.com/help/matlab/ref/waitfor.html. There is no need for any external package to use waitForDone. I’m not sure that this is supported, but you are welcome to try. Please let us all know if it works for you. I have a main GUI that calls several secondary GUIs and I’m using the uiwait function to hold the main window active but it disables the functionality of the command window and disables any other plots that i generate while its running for editing. I was wondering if you know of any way that the MATLAB command window can still be used while the uiwait function is being used to work with multiple GUI windows? @Daniel – no. You need to find an alternative to uiwait in your program if you need console interactivity. uiwait is designed for modality and what you request is not purely modal. Can you confirm that this is indeed a problem in newer versions? I experimented a little bit. my goal is to block matlab execution until something in the java environment happens. 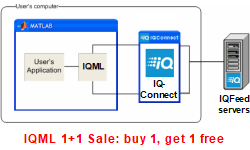 Conversion to double from name.of.class is not possible. The error message I posted earlier occurs if I wrap my class with the handle command. waitfor will still wait for a figure, so maybe an ugly workaround would be using an invisible figure in some way? About a year later, I second what Jan said. Matlab no longer allows non-scalar(able) objects passed into waitfor. I think you should update this article with a disclaimer that later versions of Matlab no longer support this behavior. Is there a way to create a MATLAB function which works similar to waitforbuttonpress, except that it does not depend on a figure? I’m looking for a way for MATLAB to detect a mouse left-click anywhere on screen (not only inside a MATLAB figure or window). The input object must be a valid MATLAB Graphics object. I was trying to wait on a user-defined class that is a descendant of the built-in handle class. Related question. I’m coding up a simulation, and I’ve got a listener in one object that is dependent on the completion of the listener in another object. (This is not gui work). They are both listening to the same event from the same object. In the dependent class, I tried busy-waiting (with a pause, of course), and it seems that no matter what I do, those two callbacks execute sequentially. based on this, I presume that matlab is executing all of these callbacks in a single thread, and the dispatcher for the event source is just executing the listeners in order, so that it can’t process the next until the prior one returns? This is not surprising. Matlab’s computational engine is [still] single threaded. I hope and expect this will change in the future. Even when it does, I’m not sure that the listeners would be dispatched asynchronously. I can think of quite a few use-cases where the synchronous listener invocation is actually intended. But no matter what I do, the waitfor is not respected, that is the pushbutton is not blocked so one can open as many msgboxes as one likes. Very odd behaviour I think, have you by any chance encountered issues like this before? Hey I know this is a rather old post, but I wanted to post my solution just in case anyone from the future has the same question. It turns out you can call back into Matlab via JMI to poll the keyboard event queue and trigger an exception if a “Ctrl-C” is waiting. I wrote this up in more detail on my blog at https://v1ntage.io/2017/07/01/episode-001-handling-matlab-interrupts-in-java/. Let me know what you think. These solutions have proven to be invaluable for me, but sometimes don’t work well for complicated asynchronous situations. I have found an additional approach that has worked very well for me so far. And then making the object available to all interested parties (through appdata, parameter passing, etc.). The object’s set(), is_set(), clear(), and wait() functions work quickly and reliably in MATLAB, and the wait() function takes a timeout parameter and returns a Boolean value that is true unless the timeout was reached. Unfortunately, using the Python object requires a separate installation of Python. While it is true that many users already have Python installed, many others do not and for such users the Python solution will error. In contrast, the solution that I presented above is based on the built-in waitfor function, and therefore works for all users. Arash Marashian (10 days 9 hours ago): Problem Solved. I found out that my version does not have this icon. thanks. Marshall (11 days 12 hours ago): This was a fun puzzle–don’t hesitate to add more posts like these if you come across some other fun ones! Reza (11 days 18 hours ago): I have the same problem. this Java widget got error in compiling via Matlab 2018! Could you please show me how to solve this? GGa (13 days 12 hours ago): There isn’t anything “outside the UTF-8 range”. UTF-8 can represent any Unicode character, as far as I know.